Compost is a great way to recycle organic material in your garden. All those spent flower blossoms, fall leaves, dead plants, grass clippings—even non-meat kitchen scraps—can be transformed into a great soil amendment and nutritious mulch, simply by throwing them into a heap and allowing the refuse to decompose naturally. Done correctly, composting creates a sterile organic material that does nothing but good things for your garden and the plants in it. But nearly every gardener who practices composting has occasionally experienced "volunteer" plants sprouting up in the garden where the compost has been spread. This can actually be rather charming when the volunteers are tiny impatiens seedlings, or tomato plants, or even pumpkins that volunteer because last fall's Halloween jack o' lanterns were added to the compost heap. But it's far less charming when the volunteer plants are hundreds of dandelions or tiny sprigs of bindweed or crabgrass that get into the garden via the compost you spread. A gardener who experiences such an explosion of volunteer weeds may well swear off composting altogether, or at least stop adding weed material to the compost pile. But there is no reason to stop composting weeds. With a slight adjustment to the composting process, you can ensure that weeds and their seeds will be killed completely and won't be resurrected where you least want them. In an ideal compost heap, the temperatures generated by the breakdown of plant material can get quite warm, and if temperatures exceed 145 degrees Fahrenheit, pretty much all seeds and roots will be killed. However, if the temperatures do not get warm enough—or if a portion of the compost heap does not experience sufficiently high temperatures—seeds or perennial roots can survive the composting process. When these seeds or bits of root later reach your garden inside the compost, they can—and usually do—quickly germinate or take root again. How do you know if your compost is getting hot enough to kill all weeds? A variety of compost thermometers are available that can gauge the temperature of your pile. Experienced gardeners may simply thrust a hand into the pile. If it feels uncomfortably warm to the touch, it likely is warm enough to kill all seeds and roots in the pile. The classic method of composting—the method purists would call the "right" way—is known as hot composting. This simply means that you turn the pile regularly and allowing it to really heat up to 145 degrees Fahrenheit or more. A properly maintained hot compost pile will kill weed seeds, as well as many other pathogens, so you can compost weeds without having to worry about them popping up in your garden beds. Turn the pile frequently. All compost heaps have localized cool spots that are slow to break down. By mixing the pile frequently, you ensure that all material is achieving the necessary heat to kill the seeds and roots. Give it time. Practiced correctly, hot composting involves processing a volume of material fully until it is fully decomposed. Don't continue to add small amounts of additional material to the heap; start another heap while the first one breaks down completely. The compost is ready to spread when turning and mixing the pile no longer causes the compost to heat up. Weed the garden before adding compost. Fresh compost is laden with nutrients, and if there are weeds growing in your garden, adding compost will simply nourish the weeds along with your garden plants. Make sure your garden is well weeded before adding fresh compost to the soil. So-called "cool composting" is a more informal style of composting. It is a passive method that doesn't involve constant temperature monitoring and mixing. In cool composting, fresh material is constantly added to the top of the heap as the lower levels are breaking down into compost. In cool compost bins, gardeners periodically remove the prepared compost from the bottom of the pile as fresh material is constantly added to the top. 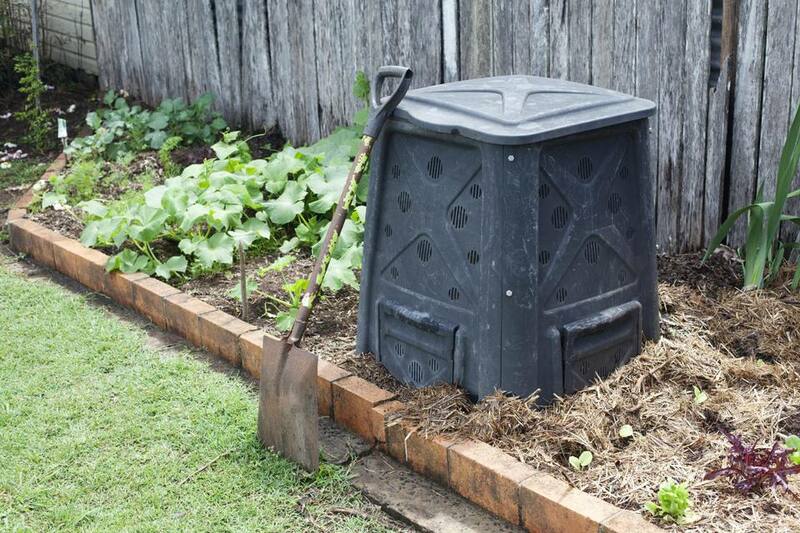 Cool composting is an easier style, though it can take somewhat longer. Don't compost pernicious weeds. There are certain perennial weeds that require lots of heat to kill, and if you don't have the time for hot composting, it is best to keep them out of the compost pile altogether. In a cool compost pile, weeds to avoid include morning glory, buttercups, bermuda grass, oxalis, quackgrass, and crabgrass. Any garden plant that spreads by runners, such as mint or raspberry canes, should also be kept out of a cool compost pile. Don't compost weeds that have gone to seed. Most annual weeds pose no problems if they are added to a cool compost pile before they are mature and set seed. But throw those same dandelions into the pile after their flower heads have produced thousands of seeds, and you may experience a dandelion epidemic when that compost is later added to the garden. If you are cool composting, weeds that have gone to seed should be thrown in the trash, not added to the compost pile. Prebake the weeds. Pretty much any plants, even the pernicious varieties that spread by runners, become safe for any compost pile if you heat them up to the temperature necessary to kills seeds and roots. There are a number of ways to do this. For example, you can solarize them by baking them inside a black plastic bag in the sun for a few days. Other gardeners bake weeds on a sheet of metal laid in the sun; once the weeds are baked to a dried crisp, they pose no risk in the compost heap. Some gardeners have even been known to keep an old microwave oven in the garage or garden shed, using it to "nuke" the weeds into oblivion by heating them until they steam before adding them to the compost heap.